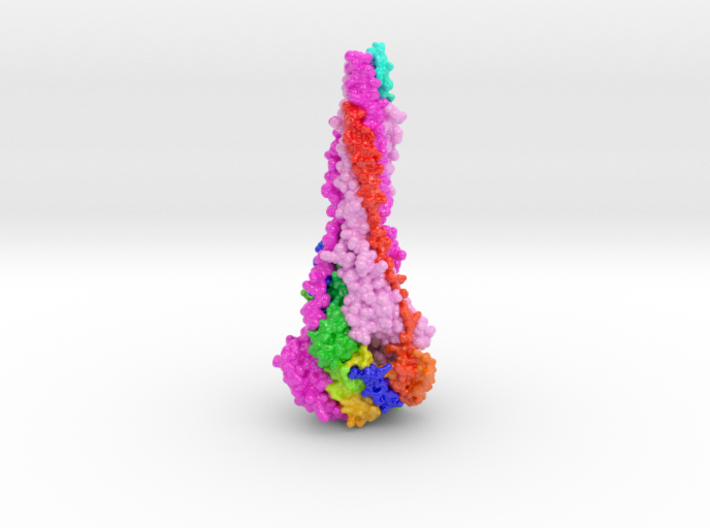 This is 3D protein model of the Zika Virus Shell 3D printed in full-color sandstone and denotes the locations of active residues targeted by antibodies. 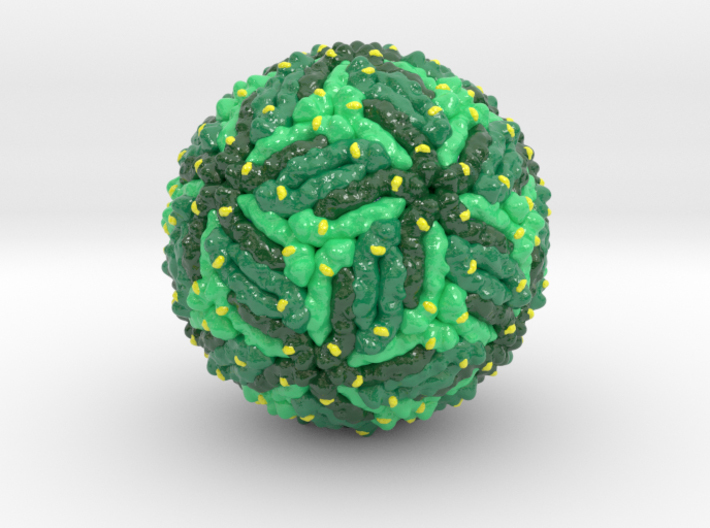 Zika Virus Shell 360 Loop from Biologic Discovery on Vimeo. Zika is a member of the virus family Flaviviridae and the genus Flavivirus. It is spread by daytime-active Aedes mosquitoes, such as A. aegypti and A. albopictus. Its name comes from the Zika Forest of Uganda, where the virus was first isolated in 1947. Zika virus is related to dengue, yellow fever, Japanese encephalitis, and West Nile viruses. The infection, known as Zika fever, often causes no or only mild symptoms, similar to a mild form of dengue fever. It is treated by rest. Since the 1950s, it has been known to occur within a narrow equatorial belt from Africa to Asia. As of 2016, the illness cannot be prevented by medications or vaccines. Zika may spread from a pregnant woman to the baby. This may result in microcephaly and other severe brain problems. Zika infections in adults can result in Guillain-Barré syndrome. In January 2016, the United States Centers for Disease Control and Prevention (CDC) issued travel guidance on affected countries, including the use of enhanced precautions, and guidelines for pregnant women including considering postponing travel. 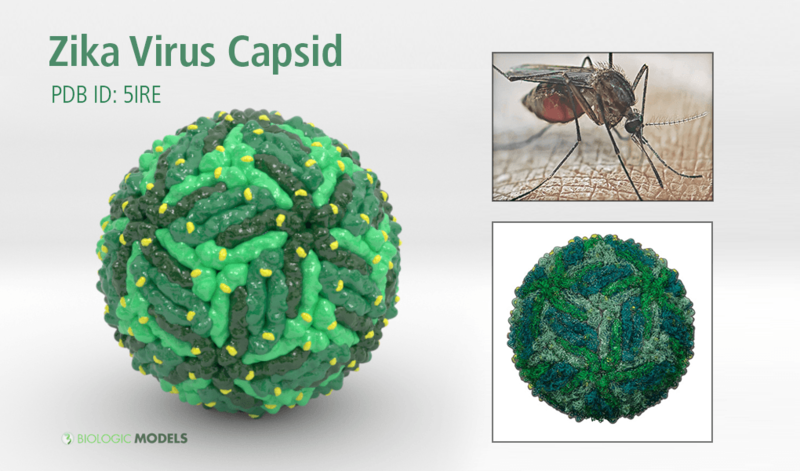 Purchase original 3D prints of the Zika Virus with a custom base! 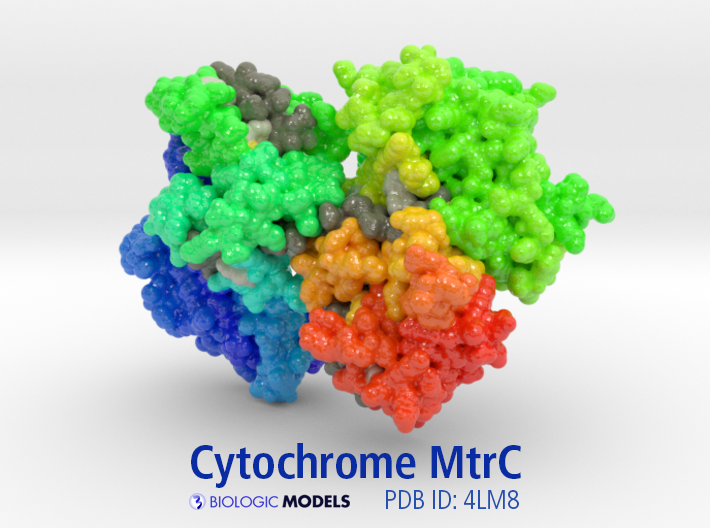 Each base includes a QR code to online information about the model.